The Baltic Sea City Accelerator brings together local governments, science and business to identify cost-effective, smart and innovative solutions to local water challenges using a strategic business lens. By fostering collaboration across borders, and enhancing cross-sector collaboration to co-develop solutions, the programme aims to accelerate local action to clean up waters and spur local economic growth.The programme’s vision is to put the Baltic Sea Region on the map as a leading example for innovative cross-sector and municipal water stewardship for the world to follow. The pilot edition of the Baltic Sea City Accelerator (BSCA) was launched at the end of 2015, and ran through June 2017. The BSCA pilot programme included seven cities from four countries around the Baltic Sea. The cities participated in the programme to increase their understanding of social and economic opportunities they could gain from locally implementing measures to address eutrophication and pollution of the Baltic Sea. Over 20 partners and experts from science, businesses and solution providers, and NGOs collaborated in the programme. 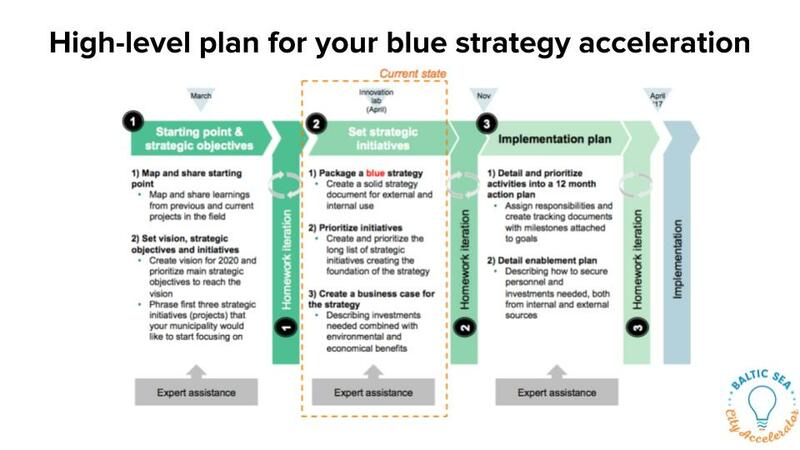 The 18-month acceleration journey included innovation labs, peer-to-peer workshops with municipalities, city visits and interviews, tailored advising for cities as they developed local Baltic Sea Action Plans, and international exposure and events. The first Baltic Sea City Accelerator was finalised in June 2017. Most of the pioneering cities are also Baltic Sea Challenge network members, and in June Panevezys sent their updated Action Plan to be presented on our website. Kalmar and Västervik have joined our network and sent their Action Plans also in June, and we are expecting the rest of the cities' updates or joining the BSC network soon. You can read the impressive action plans on the above linked cities' own subpages, they are not included in the Bank of Actions as separate actions. Read the news of the final event of the Baltic Sea City Accelerator programme here! 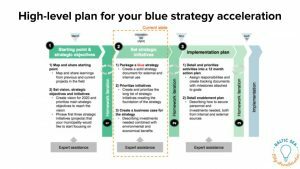 Develop your city’s blue strategy: Three step process your city can follow to identify economic and social benefits and create a blue strategy. Develop your city’s local business case for investing in local waters: The report - Restoring Waters in the Baltic Sea Region: A Strategy for Municipalities and Local Governments to Capture Economic and Environmental Benefits - by Boston Consulting Group, can be used to support cities to develop a local business case. (Download here). The Baltic Sea City Accelerator is planning to relaunch in late 2018, with a new cohort of municipalities from the Baltic Sea Region. Selection criteria is based on level of political commitment to the programme, engagement level, and dedication to becoming a leader in Baltic Sea and local water action. More specifically, application to apply requires a letter from the mayor, as well as resource commitment from municipal staff to attend events and complete the programme. An updated selection criteria and applications process will be available in September 2018. Municipalities are required to have political support as well as a commitment to participate actively in the programme, including events and tasks, with the specific goal of generating a local Baltic Sea Action Plan. Furthermore, cross-departmental collaboration within each municipality is highly recommended for participation within the BSCA. Specific details around time commitments will become available closer to launch date.